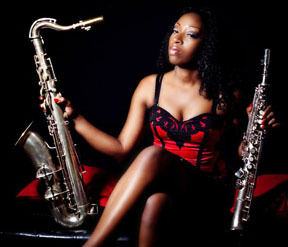 Charmin Greene Murphy – Women In Jazz Association, Inc.
Charmin Greene has played saxophone for 20 years. Bringing taste, class and elegance to her performances, she has received numerous awards; to include the President’s Award by President Bill Clinton. Having been taught by the late great saxophonist Richard Thomas and having major influences as Kirk Whalum, and Joshua Redman, her playing connects with her audiences on a deep level. She has worked with top artist in jazz, r&b, gospel, hip-hop, and pop music. She has played with Jazz artist Snarky Puppy, Frank McComb, JUNO (Nigerian Trumpeter), SOLA (recipient for Guiness Beer Greatest Producer Award in Nigeria). In Gospel she has worked as the Music Director for Spirit of Life Church in Houston, and New Life Restoration Fellowship in Round, Rock, Tx and was the Horn Orchestration Director for the Gospel Music Award (hosted by Grammy Aware – Winner Donald Lawrence). As an artist, she has played with Gospel Artist Karen Clark, Brent Jones and TP Mobb, Detrick Haddon, Kim Haddon, Kim Burrell, James Fortune and Fire, Donald Lawrence, GB5. KpAmme Rosario and George Huff. In R & B and Hip Hop she opened for Howard Hewitt, Roy Ayers and Earth, Wind and Fire and worked with Ali Woodson (Temptations), Carl Thomas, Chamillionare, Bilal and Billy D. Williams. Austin audiences have been enjoying Charmin Greene and her band on weekends at favorite local establishments.